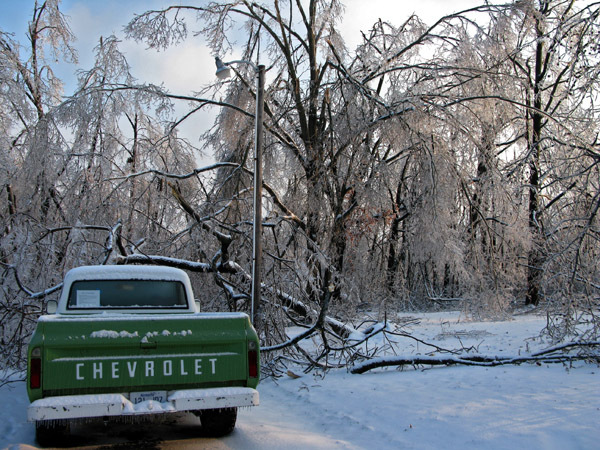 In case you didn’t know, Paducah, KY, and much of the mid-west, has experienced one of the worst ice storms of the century in the past three days. Up until last night, Nik and I were in the middle of it with my sister, brother-in-law and nieces. Their entire neighborhood has not had power for days, and probably won’t for another week or two. It is a catastrophe that I can’t imagine, even though I was there. 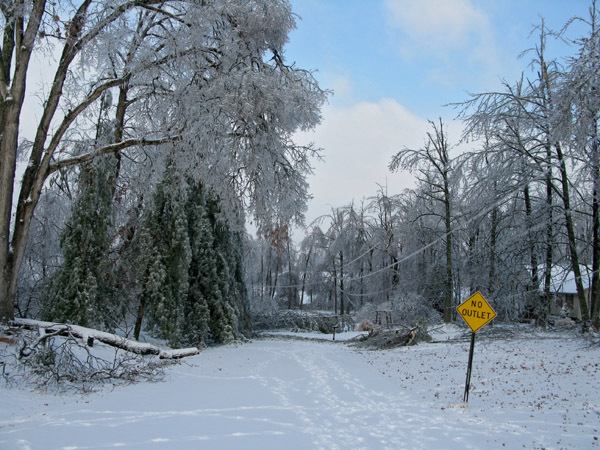 Every branch, leaf, pine needle, seed pod, birds’ nest, car, blade of grass, power line, garbage can, road sign and road was covered in at least 1/2 an inch of solid ice. Ice cycles were hanging from every fence, gutter and window sill. As we laid down to sleep Tuesday night, we heard the snap-crash-bang of tree after tree falling to the ground. When we woke up Wednesday morning, the yards looked like a war zone. 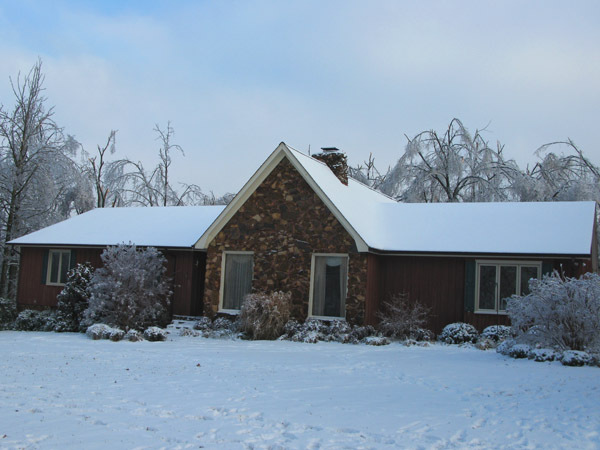 The house covered in snow. Luckily, there weren't any trees close enough to fall on the house. Several of the neighbors weren't so fortunate. Nik and I purchased vegetables from this man in Udaipur, India for our local cooking class, and the our instructor sent a neighborhood girl with us so that we didn't have to haggle!! Eric at Travelblogs.com recently opened a debate among bloggers entitled, “To Haggle or Not To Haggle”, and it has brought up several great responses from several travelers. Below is the question Eric asked as well as my response and I’d love to hear what you think as well. 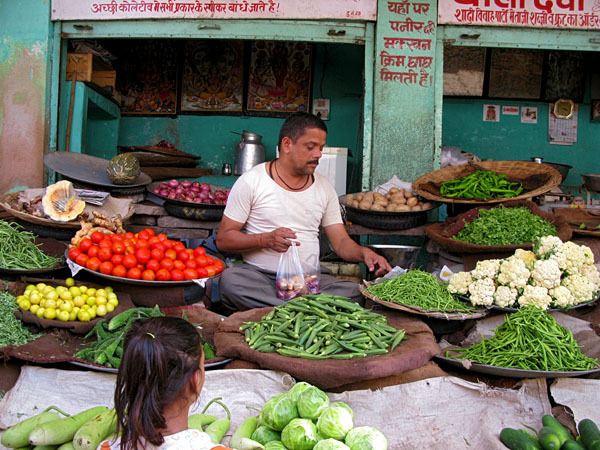 Picture this: You’re in an unnamed Asian country, buying food from a street vendor. The vendor quotes you a price which, compared to the price you’d pay for food back at home, is incredibly cheap. But you also know that the price he has quoted you is the “tourist price”, a figure that is much higher than the price he charges locals. Do you try to haggle him down, or do you pay him the price he’s asking? Haggle. Chances are that the price he just quoted me is at least double his locals price, so if I haggle him down to half way between the two, we both win. Also, I’ll gain his respect, and the respect of all the other vendors within earshot, because I understand his system so that the next time I visit his stall, he’ll probably start at the 150% mark up instead of the 200%. If he doesn’t budge, there’s always the tried and true method of walking away. If he doesn’t come running after you giving you your price, then the next vendor down the row will because they want your business. Definitely Haggle. It’s the Asian way. 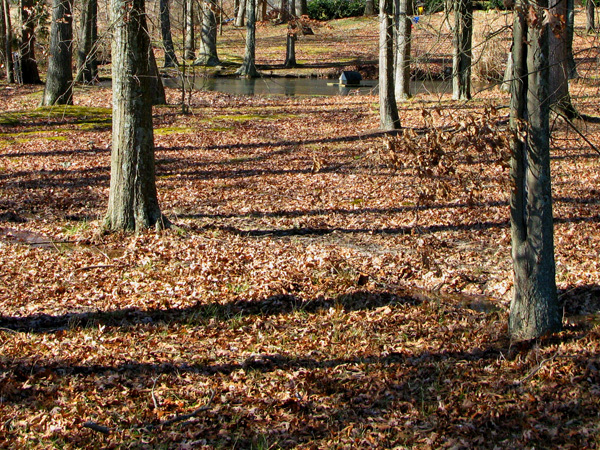 One of the many nice things about Tennessee is the mild winter. 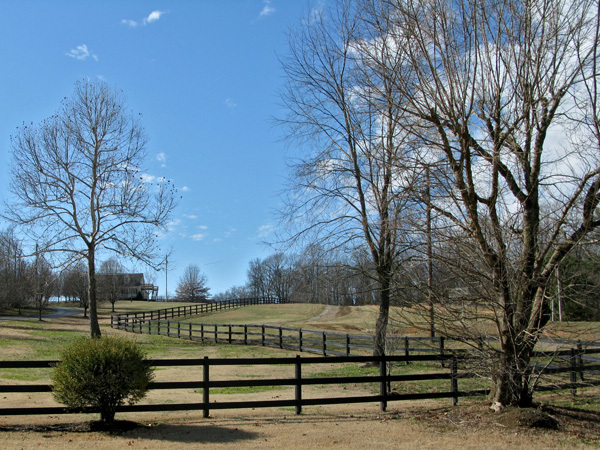 During this time of year, sunshine and blue sky days far outnumber rainy or snowy days, and the temperature often falls between 40-60˚F. This means that you can be outside nearly year round, and I am trying my best to take advantage of it by taking walks as often as I can. The first week I got here, I left the house not knowing where I would go or how long I’d be gone, and I ended up finding a great route that is about 5 miles long and takes just over an hour. All of the roads are small 2-lane low-speed country roads that wind through the hills and along streams. Every one that drives by waves, and all of the dogs call out with a bark as I pass and some even join me for 1/2 a mile or so. I absolutely love it out here, so I thought I should share!! 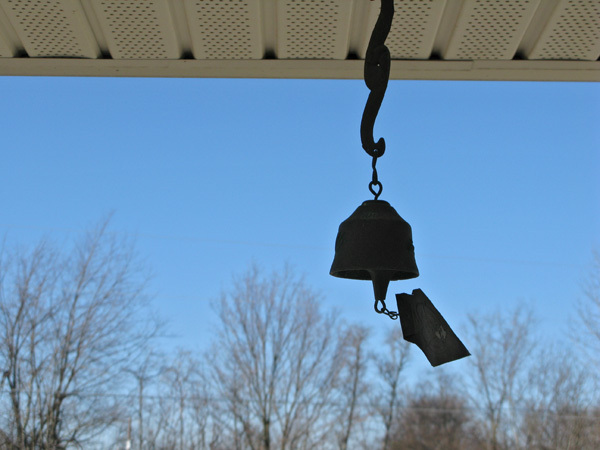 The wind chime that used to hang on my grandfather's back porch, but now hangs on my parents'. It has the best ring and does so at the tiniest gust. I love it. 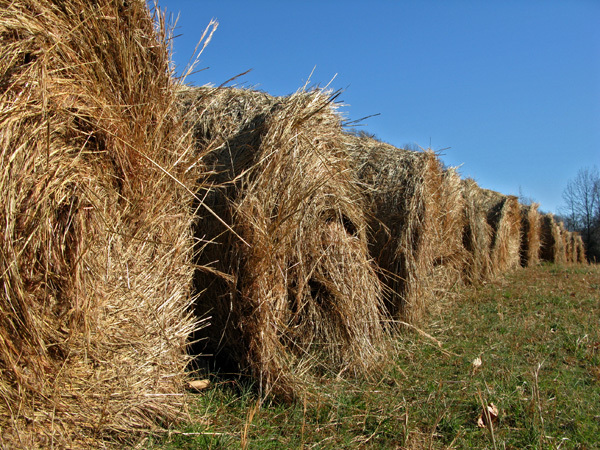 Hay bails at the farm next door. It is supposed to be 5˚F today in Tennessee, but I don't think we're going to make it since it's 50˚F right now. 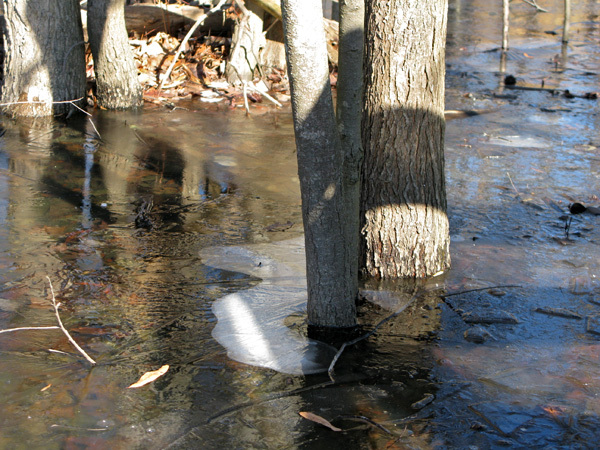 Regardless, the water from heavy rains last week is still frozen and make it look cold! 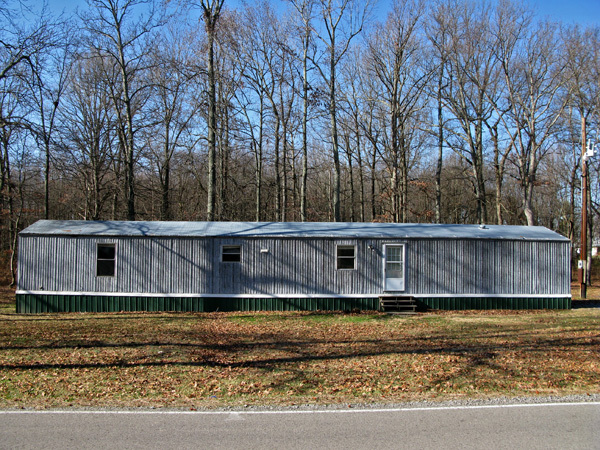 Do you ever wonder if a double wide could be cool? I think they could. 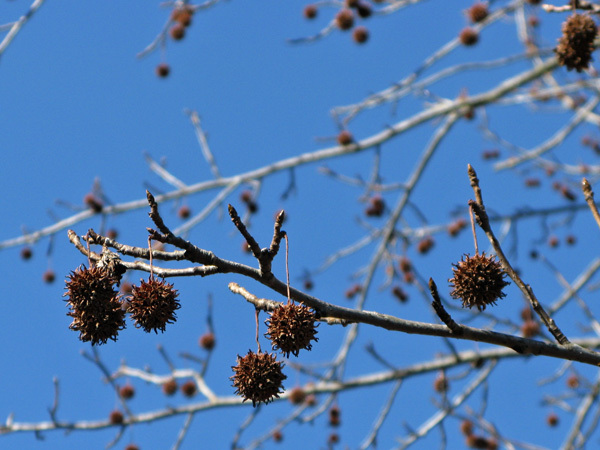 The Sweetgum seed pod, nature's version of the Christmas ornament. It kind-of looks like that could be a normal size house, but it's not. It's more the size of a large bird house. 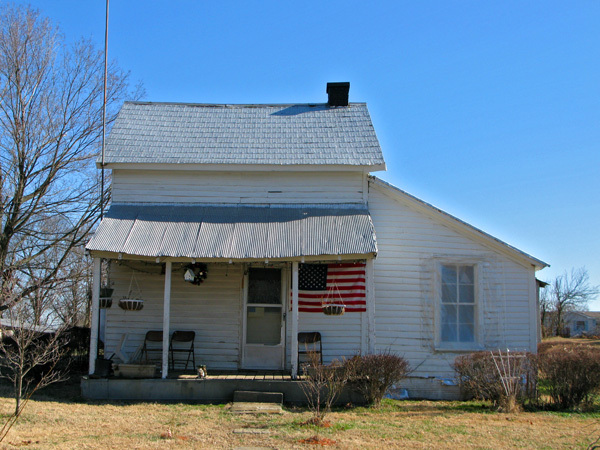 Another house, this one has a old rusted plow in the front. I love these little bits of the country in moderation. 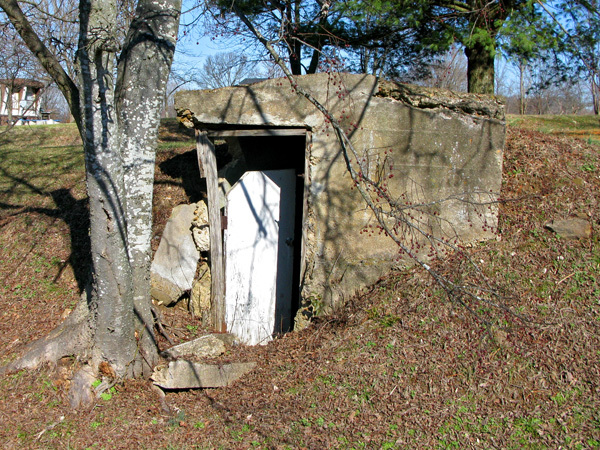 I think this is an old canning shed...or bomb shelter. 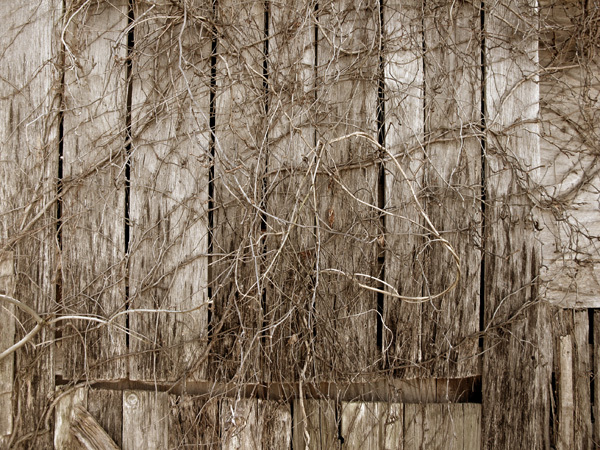 A lot of tobacco is grown in Tennessee, and this is the side of a barn used to fire-cure the tobacco leaves which produces pipe tobacco, chewing tobacco and snuff. 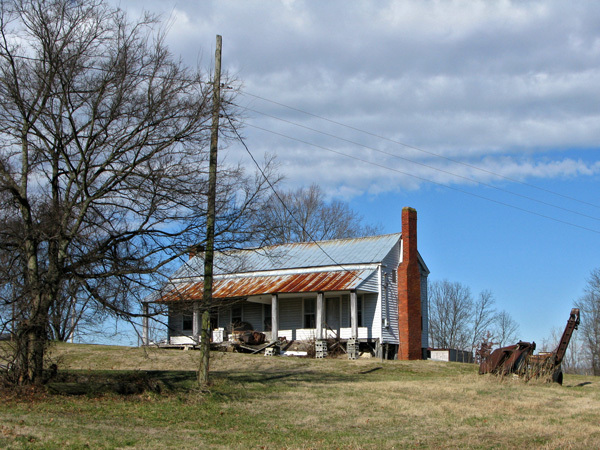 Fire Curing is a process that dries tobacco by hanging it in a large barn, and then a low hardwood fire is kept burning continuously for up to 10 weeks. I was here a couple years ago during the curing time, and it was amazing. As we drove down Hwy 25 we would smell the hardwood fire first, then we would see these huge red barns covered with green ivy smoking to the high heavens. I am not a fan of tobacco smoking or chewing, but the curing process is pretty phenomenal. This is my childhood dog, Copper (Fox and the Hound reference), brought back to life. 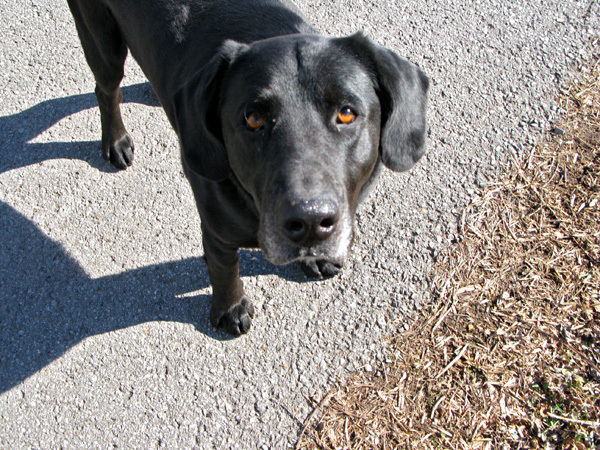 She sneaks up on me every time I walk down her road and simply nudges my hand begging for recognition. 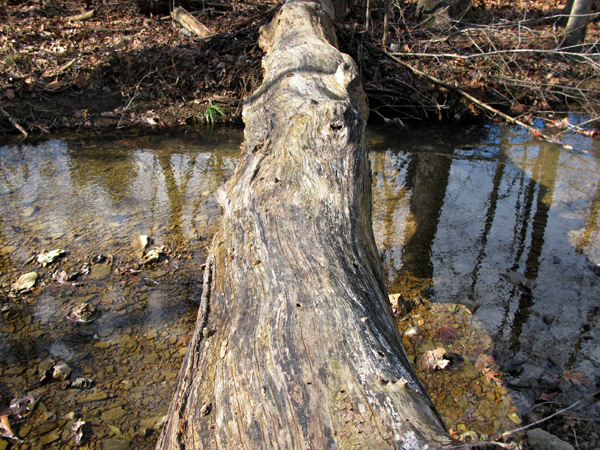 A fallen log that happens to be the perfect bridge over a small stream. 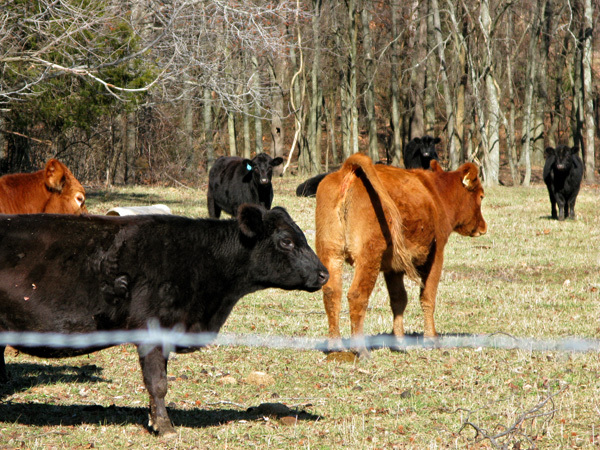 And of course, the Cows. There are probably 30 cows that graze in the land across the street from my parents' house, and when I was behind the trees they were all sitting in the shade on the other side. When they heard me, every single one of them stood up and ran away to a more comfortable distance, then they watched in fear as I took their photo. I guess they're not as used to pedestrians as the ones in India. So this is how I’ve been spending my days. Pretty nice.